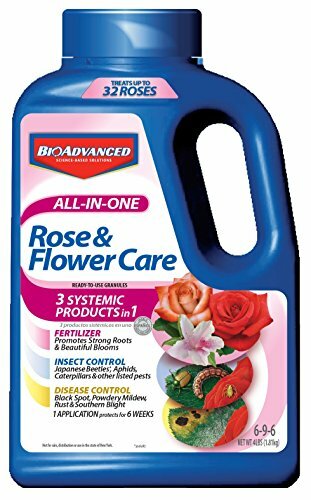 Bayer Advanced All-In-One Rose and Flower Care 4 lb. Granules is an exclusive 3-in-1 formula that feeds and protects against insects and diseases in one easy step. It provides 6 weeks protection against the major problems of roses, hibiscus, iris, and other flowers and shrubs. It is easy to use with no mixing or spraying. Growing beautiful roses, flowers and shrubs has never been easier. If you have any questions about this product by BioAdvanced, contact us by completing and submitting the form below. If you are looking for a specif part number, please include it with your message.